Wildlife and pets don’t always mix, and it is your job to keep pet safety in mind when your pet could encounter a wild animal. It can be difficult to foresee any issues with wildlife because typically pets aren’t in contact with wild animals. However, as winter fades to spring and summer, more and more wild animals will be out and about, and some of them find their way into backyards and neighborhoods. AESC wants you to be aware of the potential dangers your pet faces and how to keep your dog or cat safe. Coyotes: Coyotes are a danger to animals, because they have sharp teeth and claws and are very territorial. 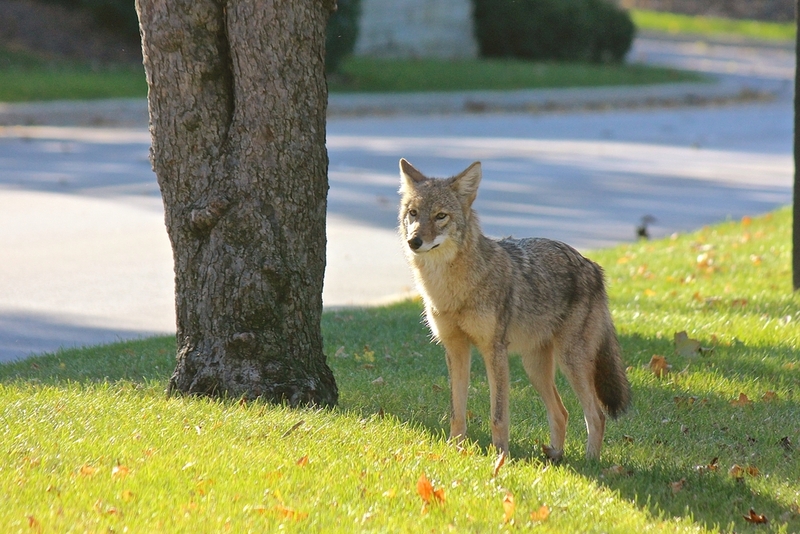 Most coyote attacks occur at dawn or dusk; coyotes generally attack cats and small dogs as they roam around their own yards. It is important that you monitor your pets, as these attacks are often very serious and require surgery. Since coyotes are a rabies reservoir species, an attack from a coyote could also put your pet at risk for rabies. If vaccinated, any pet that is attacked should receive a booster vaccine. Pets that haven’t been vaccinated should be vaccinated right away and quarantined for 120 days to allow for observation of illness. Deer: Deer aren’t generally considered dangerous animals, but during rutting season, it isn’t uncommon for a buck to attack a family pet that gets just a little too close. Bucks can cause serious injuries to cats and dogs, so you should be aware of when your pet is most at risk. Deer come out at dusk and dawn, which makes these times the most dangerous for your pet. Porcupines: A porcupine’s quills act like fishhook barbs that can puncture deep in the skin and muscle. Instead of working themselves out, quills tend to move inward and can eventually cause damage to internal organs. These quills also carry bacteria that can cause infection and abscesses. A frightened porcupine is quick to quill a pet. Rattlesnakes: Rattlesnakes are known for the unique sound their tails make when the animal is stressed. As more rattlesnakes come out for the warm spring and summer months, your pet is more likely to encounter one of these venomous snakes. A rattlesnake’s venom requires the use of antivenin to treat the bite. While a dog is typically seen as a danger to a rattlesnake and is bitten in defense, cats are often seen as prey and receive more serious injuries. When it comes to pet safety around wild animals, you will probably deal with two different scenarios: home safety and walking safety. It is important that you are aware of the ways to keep your pet safe in both situations. One of the biggest draws for wild animals is food. To keep your pet safe, the best thing you can do is make sure there is no trash in your yard and never leave food outdoors. Keep clutter out of your yard that would allow for wildlife to hide or live in. If you have noticed a lot of rodents in your home or yard, take care of the problem, as rodents can draw snakes and other predators into your yard. While you probably consider your yard to be a safe place, monitor your pet while they are outside, especially at dusk and dawn. Wild animals can find ways to get into fenced yards and cause all kinds of problems, including injuries to your pets. It is best that you supervise your pet to be sure that nothing happens to them while they are in the yard. Pet waste can also lead wild animals to your home. Be sure that you regularly clean your yard for animal waste to prevent wild animals from wandering into your yard. For pet owners who want to let their animals play outdoors, you should at least have some kind of fence to keep animals out. While wild animals are often clever and can figure out how to get it if they really want to, fences are often enough of a deterrent. If you ever see a wild animal in your yard that you are concerned about, call a professional animal removal service for help. The longer the animal has access to your yard, the more likely a dangerous situation will arise. You should also always keep your pets up-to-date on vaccinations. One of the biggest threats that wild animals pose to your pet is rabies, so you will want to make sure that your pet can’t contract the disease if they do happen to get bitten by a wild animal. When you are walking your pet, you should keep them leashed and near you at all times. Allowing your pet to roam around not only puts them at risk for being hit by a vehicle but also for animal attacks—especially if you are near a wooded area. You should always try to stay calm and avoid running away from a wild animal. If a wild animal approaches you, you should face the animal and slowly back away. Try to keep the animal from approaching by making a lot of noise and making yourself appear to be as big as possible. Stomp your feet, throw rocks or sticks at the animal, and shout. If you have a small animal, pick them up, so you don’t accidentally injure them during the retreat or allow for the animal to see them as the easier target. If you see a wild animal, never approach it. Leave a path for the animal to escape and stay as far away as possible. Getting too close could cause the animal to become stressed and unpredictable. You should also avoid areas of thick vegetation where animals could be hiding. Keep your pet leashed! Not only do leashes protect your pet, but they also protect other animals. Don’t let your pet approach, chase, attack, or play with wild animals as it is never a safe situation. Stay calm and don’t let your pet run toward a wild animal. Avoid areas known for wild animal sightings. If your pet has been bitten by a wild animal, or you suspect that they have, bring them to a veterinarian right away. If you live in the Parker, Colorado, area, AESC’s team can provide care for your pet. Contact AESC for emergency care today at 720-842-5050 if your pet has been attacked or bitten by a wild animal. If you don’t have time to call, AESC encourages you to just bring your pet in as soon as possible.